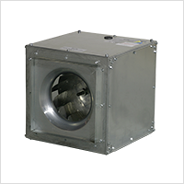 SQD and eSQD | S&P Canada Ventilation Products, Inc. The eSQD comes with S&P's Electronically Commutated Motor (eMotor) which offers the energy efficiency of a DC motor with the ease of maintenance of DD motors. The eMotor has a motor mounted potentiometer, and can be controlled by a 0-10V signal.